photos are not so current but it is a start! These are all in a second story window south facing. this window seems good for every thing except lettuce. 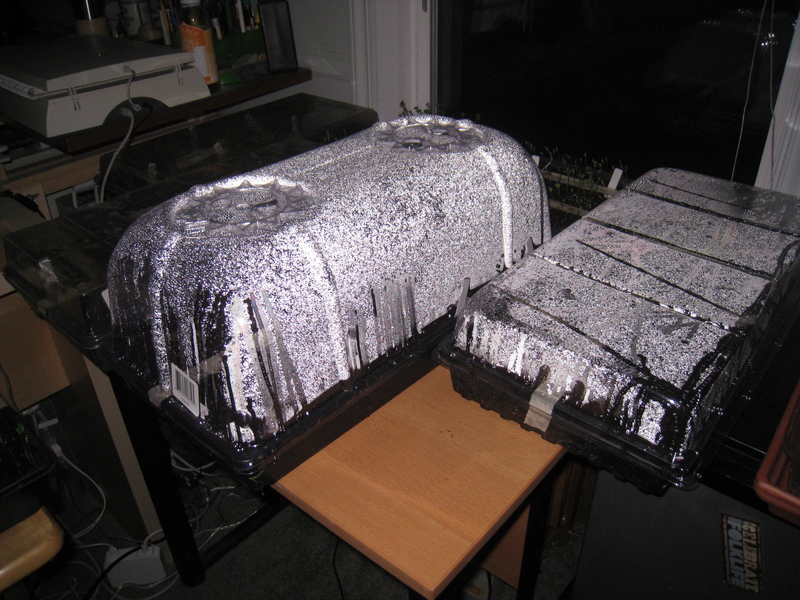 Lettuce needs a grow light I think – all of mine is super leggy. 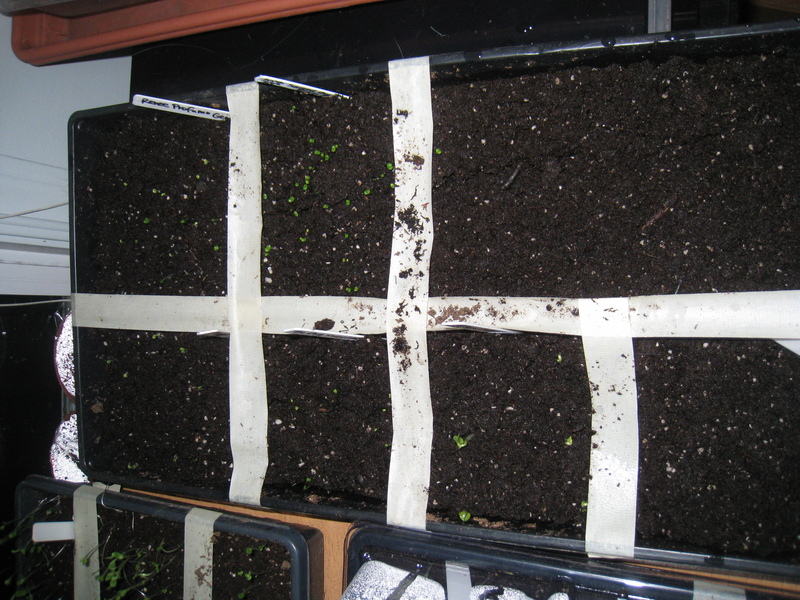 This year I taped off sections of the trays and broadcast the seeds versus doing rows with markers indicating what it was. My tomatoes were mixed up last year and it was frustrating so I am hoping this method works better. I used a lot of year old seeds and it was interesting to see the difference in what has come up. 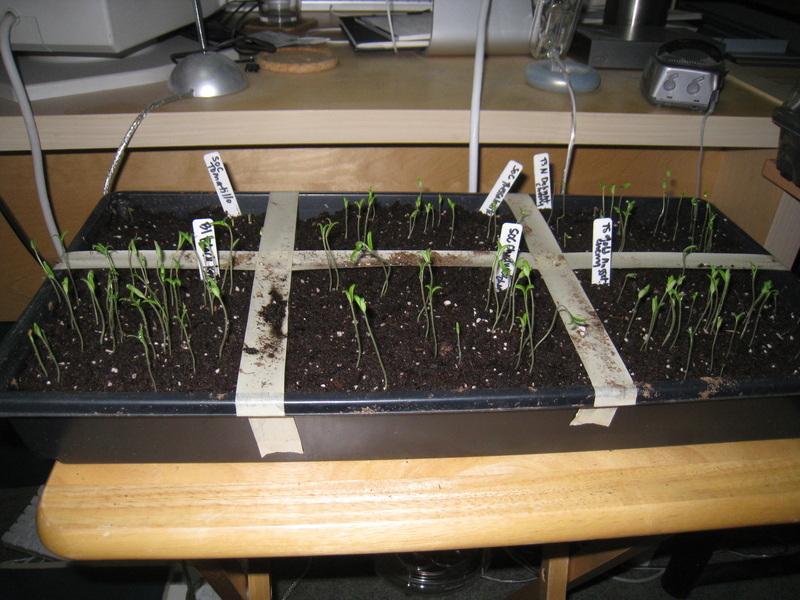 2010 Basil seeds – tons came up – 2009 about half as many. Generally it seems half as many up to two thirds as many came up. This is what I had been told so that worked for me! 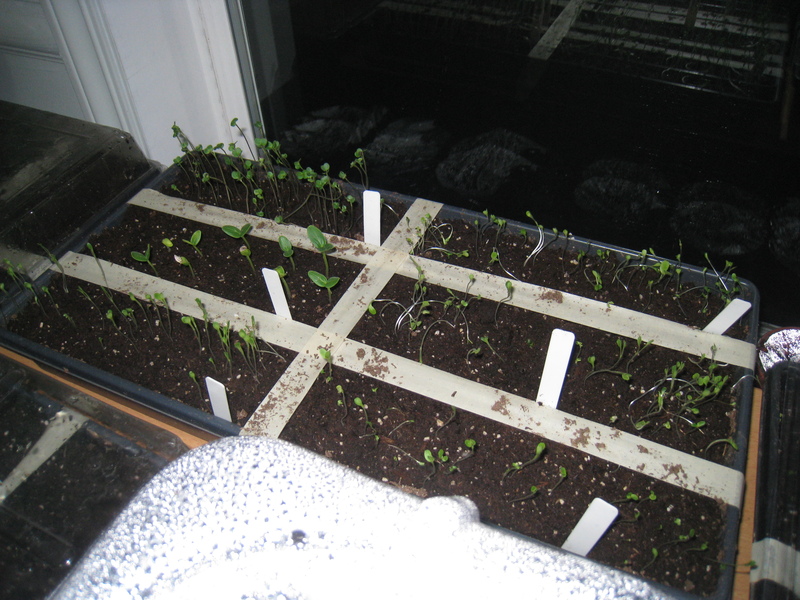 My Sweet Peas are about 7 to 8 inches high and sending out vines to attach – so I need to get them outside. Too bad this is a wet and windy week. Everything else is so big and has multiple sets of leaves that I need to transplant all to bigger containers. For the outside bed – I added Dr. Earth organic fertilizer from Sky Nursery to the bed and turned it under into the dirt. I have also added espresso grounds that I save all winter from my husband. A friend gave me extra row cover. It is pretty thin so I doubled it up and put it over everything outside. I soaked all my beets, chard and sugar snap peas in water before planting outside. This is new for me so I will see if it will help. I am hoping. Three kinds of carrots are planted. I found one more kind – purple! and it will go in this week. 2010 Planting List updated and maybe final?